And i don't know what parts can be reused or what else i need in order to have a functional new pc. So any parts that would range from small to middle that would be great, thanks! All of that should fit inside a normal tower. Don't know if the motherboard ports will line up perfectly with the back of the tower case. Oh, and you'll probably need a normal PSU (power supply unit), instead of the smallish one that comes in many slim cases. What would be your budget? Yep , it's that one, I remember now from the guy that I bought it from for like 200 dollars. After i bought the pc i got the geforce 310 and got it in. The budget can be around 400 to 1000 dollars, im not gonna buy everything at once anyways, just gonna slowly build it up as time goes on. And I guess i can get a PSU pretty easily. 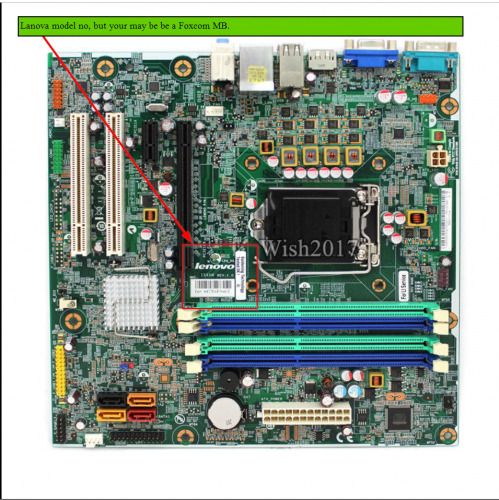 What is the model number of the motherboard? Or, if unknown, what was the model number of the computer it came out of? Well in that case, I'm afraid I don't have enough information to answer your "How will I know if the motherboard ports will line up or not?" question. Could i get you a photo? 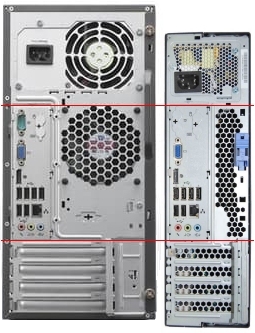 As you can see from the red lines below I overlaid on the images below, it looks like the motherboard from your Lenovo ThinkCentre M91 small form factor case might fit into a Lenovo ThinkCentre Edge Mseries Tower case. Can't guarantee it of course. Best if we get some clarification. do you have a complete computer? 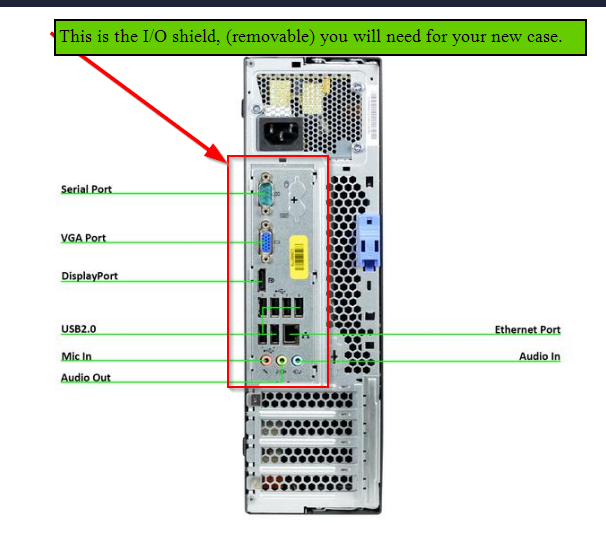 If yes, you need the rear I.O shield, example, first picture. Yours may only have a DVI and Displayport. If you only have the MB, example, second picture. If you only have parts, please list them. Ther is also a thermal sensor from the SFF case plugged into the MB, you will need that to control the fans. You'll have problems if you wish to use same motherboard. You'll have to disbale secure boot and many motherboards doesn't support new graphics card because of incompatibility issues. I suggest replace the motherboard with full ATX.